Temple Mount activist and survivor demands police investigate Sheikh who called to 'slaughter Jews' on Temple Mount. Temple Mount activist Yehuda Glick, who survived an assassination attempt on his life in October, has filed a complaint against an Al-Aqsa Mosque preacher Tuesday, after a viral video was released showing the preacher spewing hate speech against Jews. Sheikh Omar Abu Sara is shown in the video claiming that the Jews are "master of their vile traits" and that "the time for your slaughter has come [. . .] the time to fight you has come, the time to kill you has come." The complaint was filed by attorney Hor Uriel Nizri for the Honenu rights organization. Glick filed the complaint on the basis that his survival of a terror attack against his life is direct proof that such incitement leads to terror against Jews. "My client, as you recall, was nearly fatally injured, after a terrorist assassin shot him," Nizri wrote, addressing police assigned the the area. "[His] delicate health condition is not simple, and he is also confined to a wheelchair, but my client who has experienced such a serious event can not stand by and watch the above incitement, as someone who has experienced firsthand the results of incitement against Jews in general and with regard to the Temple Mount in particular." "Know that there is a real concern, under which incitement could soon become even murder," he added. Nizri demanded for the Israel police to open an investigation against the Sheikh for incitement to racism and murder, and to examine any possible involvement he may have had in prompting the wave of terror attacks rampant in Jerusalem over the past five months. "Threats and incitement against Jews because they are Jews, are the basis and cause of the Holocaust," Nizri added. "We must not allow anyone or cause to incite and threaten the Jews only because they are Jews. 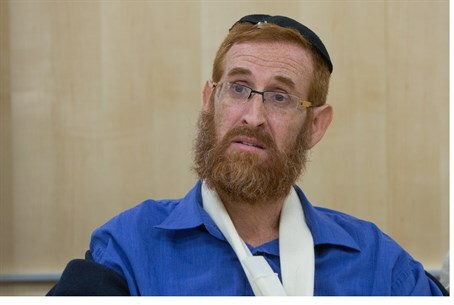 Mr. Yehuda Glick experienced firsthand that this also can lead to actual murder, and therefore we call on the Israeli police to prevent a discourse of violence against Jews." Glick - who founded and heads the LIBA Initiative for Jewish Freedom on the Temple Mount – has worked intensely to promote equal prayer rights at Judaism's holiest site, which has heavy restrictions on Jewish prayer and visitation. He was shot in the chest outside the Begin Heritage Center for his efforts to equalize the Mount in October by Mu'taz Hijazi, who was an Islamic Jihad terror ex-convict, and an employee at a restaurant in the Center. Hijazi pulled up in a motorcycle or scooter and confirmed Glick's identity before opening fire at point-blank range. He had been speaking, minutes before being shot, at an event for Jewish rights on the Temple Mount that had hosted leading religious figures and MKs.